I thought I’d never see the day but as Jeff McAffer mentioned earlier today, the latest edition of the RCP book is done and headed to the presses. Sorry for the delay, it should be on the shelves in the next couple weeks. The book covers the Eclipse Galileo release (3.5.2 in particular). 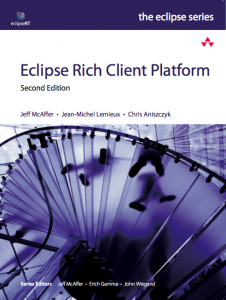 A lot has changed since the Eclipse 3.1 release so we did our best to cover new topics such as p2 and Databinding. An important focus of the book was to update the code and make sure we did a good job covering p2 as that was one of the major changes to RCP over the years. In the end, we hope everyone appreciates the update, it’s hard to please everyone but I think the community will benefit on the whole from some fresh content. One of the challenges in open source projects is quality documentation and books definitely help. On a side note, it took us awhile to choose a cover image. What do you think the cover symbolizes :)?